As you know, I plan to bring back the PRS-10 but I've been thinking about a new look. Looks great to me. Love the tritium tubes! Are there also tubes in the hands? I'm sure you'll get a few comments about the stumpy hour hand, but not a problem for me. and for me a slightly thinner orange indice at 12. It's a nice break from the norm, the blue tubes and handset are pretty cool. Crown guards are nice, I like that. Not sure about the orange marker at 12 though and I think I'd make the 3, 6, 9 and 12 markers a little shorter and make the numerals a couple of point sizes bigger and moved towards the outside a bit. On the assumption that many who aren't persuaded of the merits of your plan and opt therefore not to voice an opinion, I would suggest that anything other than a tasteful update to the original concept could well end up being one of those models you are still trying to shift 5 years down the line. I would redo the original with a box sapphire. I don't have a strong opinion of quartz vs automatic but err on the side of the former simply because this is a watch that can serve as the perfect pick up and go. For me, it's too much messing about with a classic. Just call it a 15 and then it isn't a problem? Hands style is clumpy, the orange marker at 12 looks like an after thought to me and too big for the face. Maybe slim it down or change colour or both. Shorten all indices and spread the numbers out a touch, the brand name appears too close to the top to me. Other than that, it's all bang on re case shape and size etc. I'd go fix bars and dealers choice for movement type. Yeah, something like that. Anything but 10! The PRS-15 is the Lady Speedbird, which is still on the cards. It has to be the PRS-10 because it has a NATO Stock Number. The crown guards look a touch heavy to my eye. That lume will look ace. Do you get the same stock number even if the watch has different specs? Fantastic looking “work” watch. I’d love one of those in quartz. Drilled lugs with shoulderless pins? Eddie is there any particular reason why you wouldn't simply make another batch of the originals? That was the best G10 going and I'm sure there's pent-up demand. I bitterly regret selling mine. PRS-10 is a classic. Think I've got both the BA and the precista ones. Can't understand why it never had a stronger following. Cwc are nice of course, but wr is pretty poor. I have the second version of the PRS-10, (i.e., the one with the spring bars), and I think it is perfect. I don't dislike the new proposed version but it seems like a different watch. I would prefer it to be quartz. I'd prefer the second hand to be plain white but wouldn't object to a coloured tip, either red or maybe orange to match the marker at 12? Agreed,unfortunately and I hate to say it this new design doesn’t appeal to me at all. In the spirit of offering a straightforward Yorkshire opinion, I think this latest design is a complete dog's breakfast. Another vote here for the old-style PRS-10! You almost need two watches - a gentle upgrade of the old PRS-10 with a flat sapphire crystal and different font, and this new design. 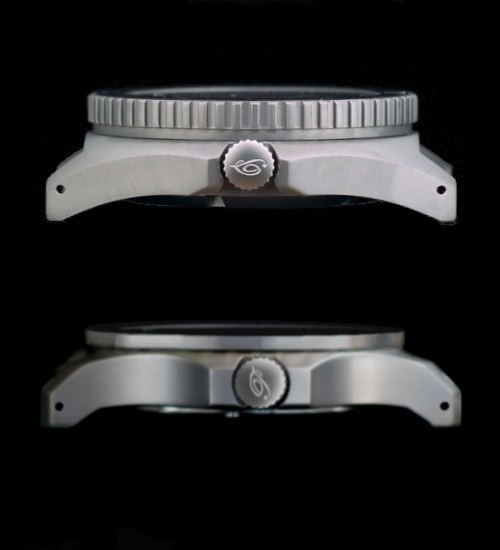 I’m not clear why the new design needs a NSN, and how the NSN can be switched between very different watches? Indeed it ain’t broke, don’t fix it. The 10 is a classic. I’d vote for a remake of the 10 with drilled lugs, shoulderless bars and less reflective hands than the previous model. Someone said earlier that you’d still be trying to shift this new design in five years but I think the whole batch of a remake I described would sell out in five days, especially at a price that’s similar to that of the original. Battery hatch is out, it would have to be as big as the case back with the lithium battery in the Ronda. I like the hands and thats about it. Sorry, but I don't like it. At all. That's OK though, because (a) I have a 1981 Fat Case CWC Navigator, and (b) I plan to buy a new PRS-29. I like the original but no date and white painted, rather than polished, hands. Its aesthetics remind me of the heavy-duty front-loading one-piece case Citizen Eco-Drive field watch sometimes shown and discussed here at TZ-UK and called, IIRC, "the Ray Mears" I think. I believe that particular Citizen watch model employed a friction fit retaining ring for the flanged crystal it held in place, though I think that purpose would be much better served regardless with a heavy-duty threaded and notched screw-down retaining ring instead. Maybe reformatting your concept above away from the standard civilian sport watch casing this one apparently has started with to the now far more rare and exclusive, and I think comprehensively far better and much more desirable front loading mono-bloc case construction similiar to the watch forum icon Citizen Ray Mears might go over very well with a broad swath of forum flocking watch enthusiasts? Love the case and integrated crown guards. Would prefer slightly smaller indices and a slightly longer hour hand. Please make it a quartz with fixed spring bars. Don’t like the orange 12 marker on the dial, maybe just an orange tritium tube would suffice? Looks good but needs smaller indices they are too long. As someone has already suggested, narrowing the orange marker would improve the look, IMO. I'm not sure how many Eddie would be ordering and holding at any one time, but I'd refer him to JSP 392 Leaflet 19 (link) as an easy digest. The HSE and EA will also have published their own guidance. This is a bit of a blast from the past. Interesting to see it emerge again, must be six years! Thinking about the tritium vial lumination for the new style G10 idea reminds me that these things have a fast half-life just like tritium paint, but because they start out much brighter than the paint, the amount of emitted glow is still useable farther from factory fresh than the paint. 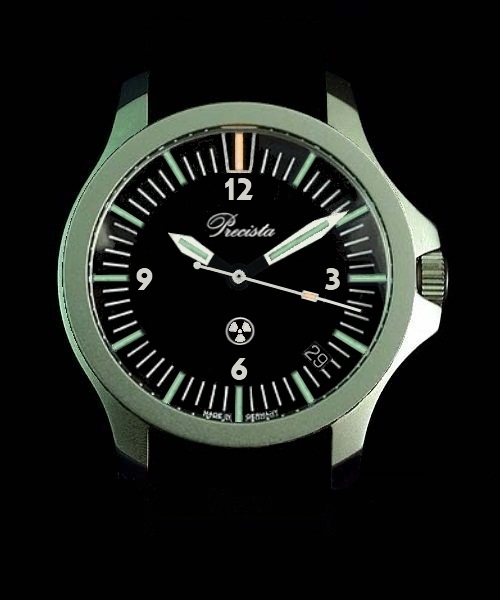 I have only a little bit of personal experience with tritium vial technology from a non-watch item I purchased new from the shop on the last day of 2002, with the item having left the factory 5 or 6 months earlier according to the manufacturer's records. It has 3 vials mounted end-on so that they appear as round dots with the length of the vials fully recessed into steel. The illumination emitted from them was extremely impressive when new, and though noticeably dimming, they still fulfilled their purpose well enough 5 or so years on from new. Not impressive at all now after reaching over 16 years of age. I think that some items do require self-generating radioactive lume, like vialed tritium, to serve the purpose intended, as with the one I referred to above that stays encased in darkness until perhaps suddenly needed in the flash of a millisecond. Light refreshed SL type lume would fail at that so the only way I know to keep things functioning to purpose is to replace the 3 tritium vials every 5 years or so. But I don't know if I'd personally want to do that with the up to 12 or so tritium vials per dial, 2 or 3 more for the hands, and maybe another for the pip of any timing bezel a tactical tool type watch might have, and the high quality and well applied SuperLuminova type lumes that TF uses would at the least give predictably reliable, functionally very good and more-or-less permanent service with no maintenance for the life of the watch. Almost anybody wearing a watch strapped or braceleted perpendicularly across the wrist can auto self-orient it without the need for any dial lume for reference at all in even absolute darkness completely devoid of light, and the only lume needed to tell the time, or measure its passage with a timing bezel, are the hands themselves and a pip for the rotating bezel. Last edited by Rollon; 14th October 2018 at 11:57. I’m not enamoured by the tritium tunes on a GS watch . I think as others have mentioned sometimes classics don’t need to be changed . 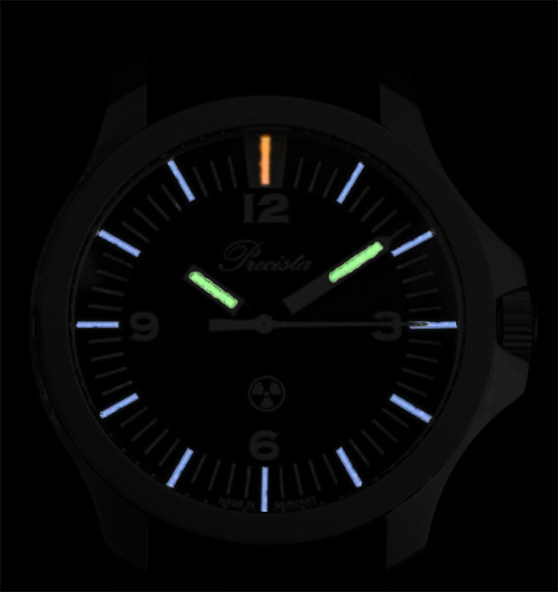 Should military style watches have lume? Don't want to be giving away your position and all that. Looks like this one is going into production and we won’t see a new batch of the original. That's not what I've said. The original PRS-10 is going ahead and this one MIGHT go ahead as a new model. Great news - the original PRS-10 with flat sapphire, a new font, and drilled lugs will be great! Apologies Eddie I must have misread the post on Facebook, although I can’t find that post now. Looks far too much like a Traser, imo. I like that profile, especially with a lug to lug similar to the PRS-18. Eddie, is it locked in stone yet that your planned PRS-10 remake will only be available with the modern dress/sport watch type domed sapphire? Or, is it all possible that the previous version's classic British military purpose-built domed and "armoured" steel tension-ring secured acrylic crystal (with its case crystal seat machined specifically for it) could still be offered in addition?